AquaBlade technology ... cleaner, quieter and smarter. Ideal Standard’s revolutionary AquaBlade flush technology is setting new standards in toilet hygiene, offering a cleaner, quieter and smarter bathroom experience, while providing the excellence in sustainability that today’s consumers expect. The flush technology builds upon almost 50 years of innovative standards in toilet hygiene: Ideal Standard says it invented the first toilet with no overhanging rim in 1979. Introduced in 2015, the patented AquaBlade technology optimises the water flow within the bowl, ensuring significantly better hygiene. 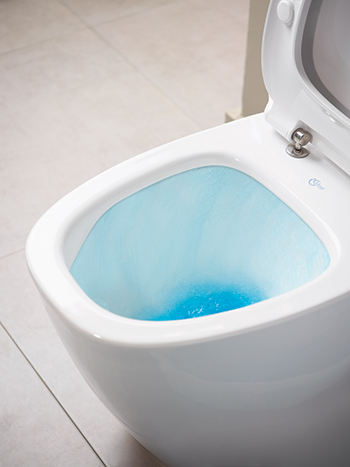 “It employs innovative Microslot technology: a fully glazed channel system guides an unbroken stream of water through two nozzles from the upper rim of the toilet bowl, providing a powerful, all-round flush. This ensures 100 per cent of the surface beneath the channel is flushed and kept spotlessly clean,” says a spokesman for Ideal Standard, a leading provider of innovative bathroom solutions. With standard toilets, around 20 per cent of the bowl remains unrinsed after flushing, he claims. AquaBlade flushing ... ensures the surface beneath the channel is kept spotlessly clean. “This system, together with its smooth, almost unbroken surface, makes AquaBlade not only cleaner, but easier to clean, as the flush does the work. There is optimal flushing even at low water volumes, making the most effective use of water possible. It also greatly reduces splashing during the flushing process in comparison to standard rimless bowls, meaning far less cross-contamination, as fewer bacteria particles are released into the air,” he adds. The new technology is also quieter, with an almost 25 per cent reduction in noise compared with traditional flush systems. The elegant aesthetic design of AquaBlade is also exceptionally clean, and no unsightly, overhanging rim means a smooth, almost flat, surface, broken only by a neat, barely visible, line. 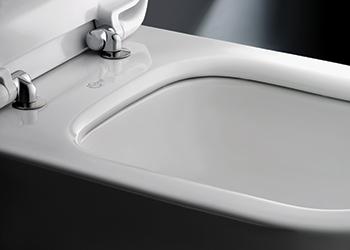 According to the spokesman, European market research finds has found that eight out of 10 consumers prefer toilets with AquaBlade design technology over standard models. Since its launch, AquaBlade has won multiple awards for its functional design and advanced technology, including the IF Design Award 2015, the Red Dot Design Award and the German Design Award. The patented AquaBlade technology has also won the Innovation Award for Architecture + Technology, conferred by the architecture journals AIT and Xia Intelligente Architektur. AquaBlade is available across many Ideal Standard bathroom ranges. These include wall-hung, back-to-wall and floor standing bowls, and the Connect, Connect Air, Tesi, Dea, and Tonic II ranges. Ideal Standard International is a privately-owned company headquartered in Belgium, operating in more than 60 countries across Europe, Middle East and Africa. Ideal Standard Mena, its sister company, focuses on the growth and business opportunities of Middle East, Egypt and Africa, with its head offices in Dubai, UAE.